The first major issue with this poster is the choice of the word “risk.” Slips, trips and falls are potentially injuring but is the action itself risky? Walking or running out of a bus is risky because there exists the potential to trip, but once you’ve already started to trip no new risks are being taken because, presumably, you don’t choose to follow through with the trip – it just happens. The poster should have said “running is risky because you may slip, trip or fall” or maybe “slip trip or fall is dangerous.” But slipping can’t be said to be risk-taking, at least not how I understand the word. I think this picture is self explanatory about why reference frames are important. 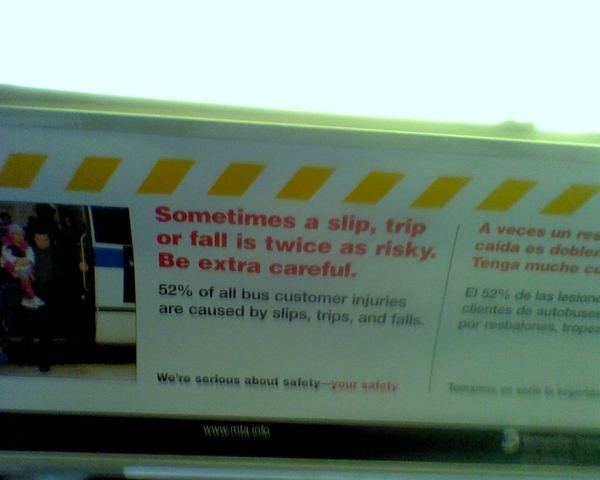 The other glaring error is the quantitative element: that a slip, trip or fall is twice as risky. Twice as risky as what, exactly? If you’ve already tripping, the risk that you will continue to fall is fairly high – probably more than 2. So I don’t think that’s what they mean. Most probably, slip trips and falls cause bus-related injuries two times more frequently than some other incident – though we can only imagine what that might be. Since they also qualify the statement with sometimes – when exactly should I be worried about slipping and tripping? What are the risks when these conditions don’t apply? What bothers me so much about this poster is that they don’t provide reference, nor do they explain under what conditions are slip, trips and falls more likely (only that they sometimes are). Reading that poster, should I be nervous about suddenly and randomly slipping out of my seat – because, sometimes, that’s twice as likely (twice as likely as gravity reversing and I get stuck to the ceiling, maybe?)? This poster basically tells me nothing because they don’t frame it around a stable reference or provide relation – I don’t know how likely I am to trip at any given moment. Realistically, I realize that the poster is only trying to make passengers aware of a common problem in bus safety, but it would have taken about an two extra seconds to realize the statement is nonsense and to fix it. Now, every time I see it on the bus (thankfully not every day) I am forced stare at the poster in frustration.